Start your meal with a Mediterranean-inspired dish that uses simple ingredients and adds a fresh splash of colour. Preheat the grill to high. Place the tomatoes in a single layer on a baking tray. Season with salt and freshly ground black pepper, sprinkle the garlic over and drizzle with the olive oil. Grill the tomatoes for 4-5 minutes, or until they just begin to soften and the garlic turns golden brown. Place the hot tomatoes, garlic and cooking juices in a bowl and add the dressing, capers, mozzarella and parsley. Peel, stone and quarter the avocados. Take four serving plates and place two avocado quarters, slightly overlapping, on each. 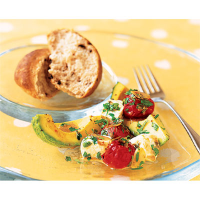 Spoon a little of the tomato mixture over the avocado and serve immediately with some warmed Waitrose Mediterranean Olive Bread to mop up the juices. Try the rest of this month's alfresco menu: Caramelised Pork, and Baked Summer Fruits. If you prefer, replace the capers with pitted black olives.